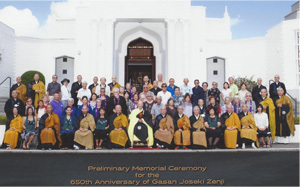 A Preliminary Memorial Ceremony for the 650th Anniversary of Daihonzan Sojiji's second abbot Gasan Joseki Zenji, was held on Friday, September 12th and Saturday, September 13th at Shoboji in Honolulu, Hawaii, U.S.A. The year 2013 marked the 110th anniversary of Soto Zen Buddhism in Hawaii since the beginning of the dissemination of Soto Zen Buddhism. Teaching has continued in a lively way, conducted mainly by Kokusaifukyoshi. In Hawaii under the bright sunshine, while the heat was over 30 degrees Celsius, Rev. Yudo Saito, Director of the Mission Division, Sotoshu Shumucho, who would serve the officiant at the Preliminary Memorial Ceremony, arrived. From the Daionki Office of Daihonzan Sojiji, Rev. Seishi Ishida, Assistant General Director and Rev. 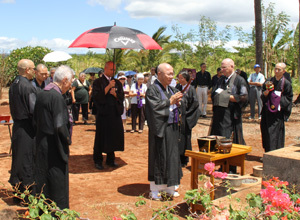 Horyu Otsu, Director of Ceremony Division, and also more than 20 monks and nuns from the state of Hawaii and all over the world gathered and participated in the ceremony. On September 12th, from 3:30 p.m. the Special Decoction-offering Ceremony was officiated by Rev. Shugen Komagata, Director of Soto Zen Buddhism Hawaii Office, and held solemnly with about 50 members of Shoboji and of temples in Hawaii. After the ceremony, Rev. Horyu Otsu lectured on the life of Gasan Joseki Zenji. All the participants seemed deeply impressed by the footsteps of Gasan Zenji who dedicated his effort to the development of Soto Zen Buddhism and the education of his disciples during his whole life. On September 13th, from 9:30 a.m. the Preliminary Memorial Ceremony was officiated by Rev. Saito. 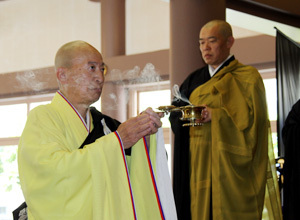 This ceremony was held according to the manner of the most respectful ceremony in Soto Zen Buddhism. It is called "Dengu Ju-happai." 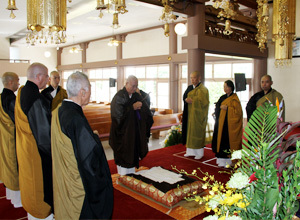 While the members of the Baika group in Hawaii sang the "Hymns of Praise for Gasan Zenji, Daihonzan Sojiji's Second Abbot," the officiant passed the offerings to the altar sincerely and made the eighteen prostrations. After the officiant presented the Dharma phrase in admiration of Gasan Zenji, the monks who were at both sides (Ryoban) advanced to the altar and burned incense, and then all the monks and nuns made nine prostrations together. After that, the rector (Ino) read the statement "Sho," which praised Gasan Zenji's virtue and the significance of this ceremony. At the end of the ceremony, Rev. Saito read the message from Rev. Koichi Sasaki, the President of Sotoshu Shumucho. As the representative of Daihonzan Sojiji and the Daionki Office, Rev. Ishida expressed appreciation for our performing this ceremony. He announced that everybody was welcome to visit Sojiji for the Great Memorial Ceremony next year. The preliminary memorial ceremony was completed safely and smoothly. After the ceremony, all participants set out on a Buddhism Study tour in Oahu Island by buses in order to study the history of Japanese immigrants and of Soto Zen teaching activities in Hawaii. First, we visited Waialua Japanese cemetery and Kawailoa Japanese cemetery, at which many Japanese immigrants were laid to rest, and had a memorial service for them. Next, we visited the old site of Ryusenji temple in Kawailoa. There had been large farm of sugarcane since the population of Japanese immigration was increased drastically in the late 19th century. In 1904, a temporary temple was opened by Rev. Ryuki Hirai who was from Beisanji temple in Hiroshima Prefecture, and afterwards, Ryusenji was founded. Ryusenji was the only Soto Zen Buddhist temple in this area, so it had been the primary supporter of faith for Japanese immigrants and the center of Japanese cultural activities. However, a lot of Japanese immigrants lost their lives by accident or disease while doing hard work under severe conditions. When the Pacific war started, Japanese immigrants were interned in the Japanese internment camps as "Enemy Aliens." After most of them left this area, the graves of those who had no relatives were ignored. After the war, Ryusenji was moved and rebuilt in Wahiawa in 1976 by eager Japanese immigrants who overcame many difficulties during the war, and even now it has been maintained by the members. Recalling the hardship of the Japanese Americans in Hawaii during the war, we came back to Shoboji and completed the schedule concerning this Preliminary Memorial Ceremony in Hawaii. We have already finished the Preliminary Memorial Ceremonies beginning in April, in 9 regions in Japan and 3 regions outside Japan. With the completion of the ceremonies in Hawaii, all the Preliminary Memorial Ceremonies scheduled previously were completed smoothly. On this last report of the Preliminary Memorial Ceremonies, we would like to express our deep appreciation for all those who participated and cooperated in the ceremonies. Thank you very much.